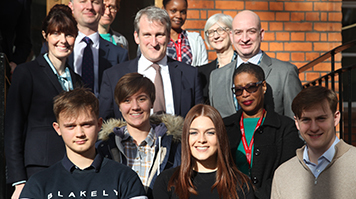 London South Bank University (LSBU) staff and students welcomed a visit by Damien Hinds, Secretary of State for Education on Thursday 7 February. Mr Hinds visited LSBU’s recently opened apprenticeship hub, the Passmore Centre, to learn more about the University’s degree apprenticeship programme, meet with student apprentices and employers. Damian Hinds met with three LSBU nursing associate degree apprentices from the University’s School of Health and Social Care and with Building Service Engineering and Civil Engineering apprentices sponsored by engineering design consultancy, Waterman Group plc. Mr Hinds heard directly from each of the apprentices about their individual decisions to pursue an apprenticeship and the benefits and challenges of combining work and study. Ahead of national Student Volunteers’ Week, which kicks off on 11 February, Damian Hinds also met with students from LSBU’s School of Engineering who volunteer at the local University Technical College and Engineering Academy, both of which feature in LSBU’s south London ‘family’ of educational institutions. The visit concluded with a discussion including members of LSBU’s Health and Wellbeing team about support the University provides to students with mental health issues. This was followed by a student giving a personal testimony describing how LSBU helped him to overcome mental health challenges and go on to complete his degree. LSBU currently has around 700 apprentices enrolled. The University currently offers 18 degree apprenticeship standards and is aiming to enrol 2000 apprentices by 2020. The five main apprenticeship standards fulfilled by LSBU include, Health Assistant Practitioner, Nursing Associate, Chartered Surveyor, Civil Engineer and Building Services Engineer. The top five employers the University supplies the majority of apprentices to are Transport for London, NHS Trusts (Kings, GSTT, Lewisham and Greenwich). A selection of some of the main employers in the public and private sectors that LSBU works with currently include: the Edge Foundation, Unilever, Mace, Transport for London, Environment Agency, Foreign Office, Lidl, NHS, plus a range of small architecture practices.